Oceanic and lake sciences challenge the abilities of traditional software tools. Virtually everything of interest lies beneath the surface. This is a 3D world with complex issues that affect the life in these water bodies and all life on Earth. EnterVol provides the technology to address a myriad of surface and volumetric subsurface issues. 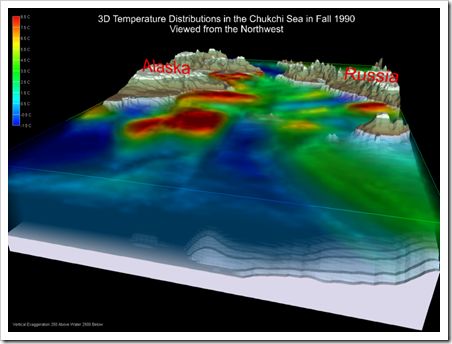 The US National Oceanic and Atmospheric Administration’s Pacific Marine Environmental Laboratory and Russia conducted oceanographic research in the Chukchi Sea in September and October 1990 to collect the data represented in these visualizations. Waters from the Bering Sea feed the Chukchi Sea through the Bering Strait before entering the Arctic Ocean. 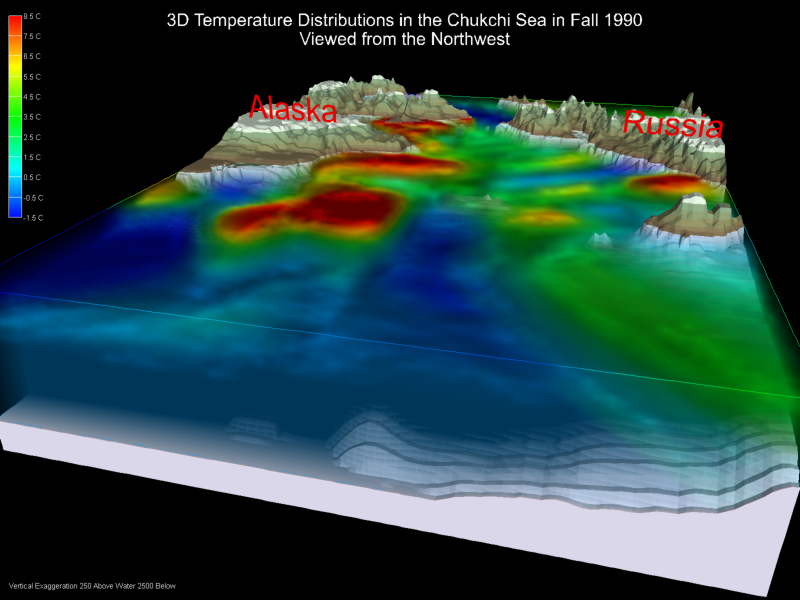 The Chukchi serves as a rich feeding ground for Bowhead whales and other marine mammals, and serves as a transition area for pelagic seabird species. CTD casts to measure Conductivity, Temperature and Depth were used to determine temperature and salinity distributions in the various water masses. 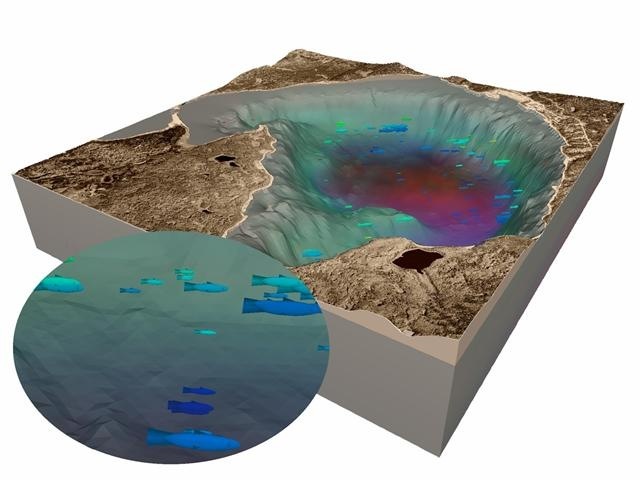 This data is used to determine ocean properties that may explain fish and mammal behavior. For example, a strong cold pool or high area of salinity may aggregate prey (invertebrates and planktonic fish), thus providing fertile feeding areas for marine mammals. * Image generated in MVS. Fisheries ecologists and wildlife biologists attempting to understand the relationship between marine mammal foraging, prey densities and physical environments may overlay foraging data from satellite or radio-tracked animals with oceanographic data to understand these interrelationships during one season or over several years of data.